What a sweetie my horse is. He doesn't bite or kick, lets me catch him, rub his ears, pick up his feet, tack him up and steer him around. Is my horse trained, or simply good-natured? A horse is generally a pleasant creature. Especially if it has had decent handling from birth, been herd socialized and had few experiences of entrapment or fear. Unless trauma and undo stress is normal (and often even in spite of this) most horses are compliant, safe creatures. Because an animal lets me do things to it, does that mean it is trained or is it merely tolerant? (By the same token, if the horse doesn't let me make it do things, is it stupid and intolerant?) 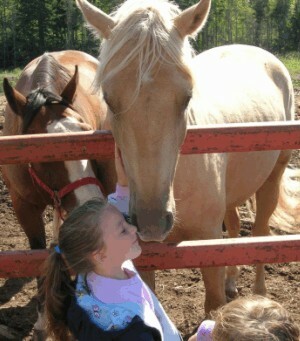 Do not get me wrong- I want a good natured, tolerant horse- but that is merely the starting point. A lot of horses (and most people) remain good-natured as long as you do not take them out of their comfort zone. Change and stress generally reveal true character and upbringing. I have seen many creatures of little use due to lack of training. These good natured beings tend to get into ruts and habits that severely limit their potential in life. I do not want my daughter to not know how to wash dishes or clothes, apply for a job or college simply because her "good nature" should open all the doors of life. No, we do not all have to be an Albert Einstein or Mother Teresa. Nor does our horse have to qualify for the Olympics. But floating through life thinking good nature will naturally culminate into good manners and usefulness is doing the world and yourself a disservice. With those animals we deem our pets or projects and thus our responsibility, we need to look beyond good nature and apply sound training principles to take them to new horizons. Horses were designed to not merely exist, but also strive. Finding food, a mate, defeating draught, famine and cold gave a creature a reason to LIVE. We take our animals and often do not balance the easier life with work (training). I have often heard of people and animals that give up on life when placed in retirement. Proper teaching of manners and new experiences beyond natural occurrences will encourage better manners and behavior. And do not mistake repetition of activity on the horse's part for training (a horse knew how to walk, trot and canter and jump before you came along). Too often we blame non -performance on his pig headedness and stupidity (he was sooo good yesterday at home), when it is more often incomplete training. We do not seem to afford the horse the same slack we cut ourselves- we expect their performance when we have not done our job in the first place.